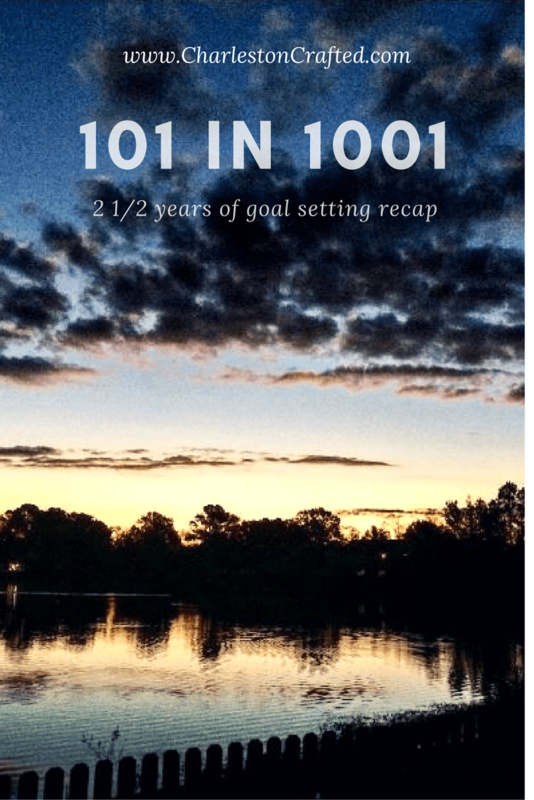 A couple of years ago, we launched an endeavor to accomplish 101 pre-planned tasks in 1001 days. That’s roughly two and a half years. Our 1001 days actually came to a close about three months ago, but we’ve been so wrapped up in house projects since we moved that we actually forgot about it! Well, we wanted to take a minute to kind of wrap up our experience with our 101 in 1001 and talk about what we loved doing and what we weren’t able to quite finish. We ended up completing 65 of our 101 things. It doesn’t sound that great, but when you look at some of the things we did, they were pretty big. Also mind you, this was a list we created two and a half years ago of things we thought at the time we’d like to try to do. We definitely did WAY more things than this in that time that weren’t on the list. But yeah, let’s call out some of the big ones we are especially proud to have completed! We ate at several really good restaurants, like The Ordinary, The Grocery and Kiawah’s Atlantic Room, but we also didn’t go out to eat for a month too. We tried out a lot of other great restaurants in that time that opened up, but didn’t make it to Husk… still. We redid quite a few rooms in the condo we owned, like painting the laundry room pink, redoing the pantry (which we just did again in our new house, boom clap), repurposing some furniture, and so much more. Then we sold the condo and bought our first home! We’ve been super involved in the work on the house so far (see: reason we are just now getting back to this post) and have tons more to do over the next couple years. We took some AMAZING trips on our 101, like going to Yellowstone and Europe (Italy for our honeymoon), but we also went great places not on the list like Kauai, Hawaii for our anniversary this year. Oh yeah, to have a honeymoon and an anniversary, we had to get married, which was also on the list. Check! We checked out every single one of the Charleston County Parks, including two that opened in the middle of our 1001 days. We went to concerts, sporting events, Spoleto, Wine and Food, beach sunsets and sunrises and so much more. Our blog really got going during this time, and a lot of it has to do with the 101 in 1001. It forced us to try new things and blog about them and spread the word to you, our readers. That led to being featured on quite a few other sites and blogs and has helped our online presence tremendously, so thank you! We both tried some new things individually too, like running an Olympic triathlon, buying each other special random gifts, paying off loans and visiting sports stadiums. We love spending time together, but it was great to do some things on our personal lists too. So there were 36 things we didn’t complete from our list. Some were lack of really trying, but some were just not easy enough to do, or we never felt compelled to do it, like visit ALL of Charlestons Plantations, or buy a sweetgrass basket (which cost a lot) or go to an NHL hockey game when the closest team is 4 hours away and neither of us likes hockey. We could have tried harder to get some of them, but we’re not to upset about it. There are things on there that we still do want to try, and we can still do them even though our 101 in 1001 is over. Plus, again, it’s not like we didn’t do other great things during this time, we just didn’t know about them to put them on our 101 list when we started. So that’s how it went. We had a great time and it kept us motivated. We may try again, but life may start to get really unpredictable in the relatively near future, so that might be tough. Who knows. « How to Make and Keep Resolutions and Ours for 2017!